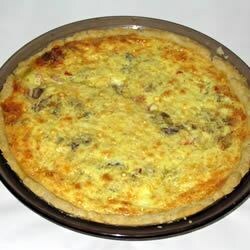 "Shrimp, Edam, and mushroom make this an elegant quiche. I use Red Hot Dutch Edam to give this a spicy kick, but if you can't find it, use regular Edam and spike it with red pepper flakes instead." Melt butter in a skillet over medium heat. Stir in the onion, and cook until softened and translucent, then stir in mushrooms. Cook for an additional 3 minutes. Pour in red wine, and simmer until the liquid has nearly evaporated. Whisk together eggs, sour cream, red pepper flakes, and salt until smooth; stir in cheese. Place shrimp into the pie shell in an even layer, sprinkle mushroom mixture over top, then pour in custard and spread evenly. Bake in preheated oven for 50 minutes until set. Allow to cool for 10 minutes before serving.